It was an answer to prayer to have such a massive “Claire’s To Do” list from Laura Propst when I arrived in Korr. I knew that I would have no trouble being social (I never do), but I desperately wanted to be able to really serve and be useful as well. The Lord created me with an insatiable desire to be doing and He has been good to provide an outlet for this desire during my time with the kids at Tirrim Secondary School. So, right now I’m working to balance all the registration fees from the beginning of the school term. These records are an absolute disaster. For some reason students were let into school without paying their full tuition, so our expected and actual fee collections are lopsided. 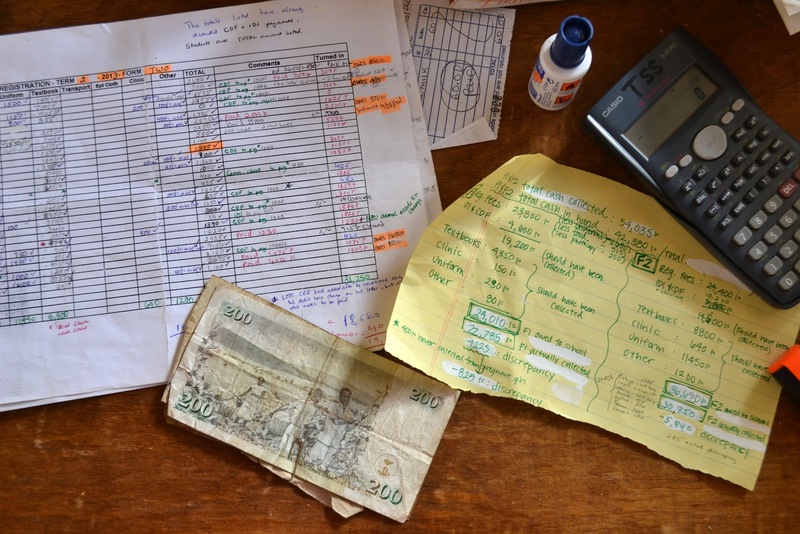 Then, some of the teachers started to pay school bills out of the registration money pot without waiting for the records to be balanced, wreaking havoc with my numbers. I’m not complaining, I’m just saying it’s a big job to get this all sorted out, but I’m delighted at the prospect of presenting Laura with perfectly sorted Kenyan shillings and spreadsheets by tomorrow! However, there is a situation at school with which I am not delighted. A year and a half ago I had a student named Diba who gave me lots of grief in and out of class. Sass-mouthing, not getting work done, being out rightly defiant… He has never had a father (I believe that the father passed away) and he’s not from a Christian home, so this kid carries bags of hurt and anger around on his shoulders wherever he goes. In his attempt to cope with a burden only Jesus can carry, Diba tries to protect himself by lashing out at those in his path and never forgetting a perceived offense. I have been in his path and I have been perceived as offensive, so I am on Diba’s “list.” It breaks my heart, but the kid won’t even look at me. There have been three times in the past few days when our paths have directly crossed, and Diba has put on a frown a mile wide and cut a path around me just as large. This morning I prayed about my relationship with this boy, asking how I might proactively pursue even a simple greeting with him. I thought my chance had come this afternoon when I was invited to sit with a certain group of boys during lunch. As my student Meshak led the way around the corner, I saw Diba sitting in the shade with the gang I was to join. He hesitated only for a moment, perhaps wondering if his bad luck would continue and I would actually sit down, before abruptly standing and taking his food, and our chance for civility, with him. Blast. I do wonder what I should now pray for regarding Diba himself and our relationship… Do I tackle the kid in the schoolyard and say, “Hi”? Should I slip him a note? Would it send him over the edge if I sat in on one of his classes and conveniently chose the seat right next to him?